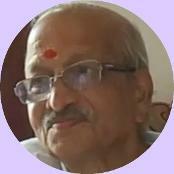 Ramakant Maharaj (b. 08 July 1941, d. 31 August 2018), is a direct disciple of the late Shri Nisargadatta Maharaj(d.08 September 1981) and spent 19 years with him. An Indian spiritual teacher of Advaita (Nondualism), and a Guru, belonging to the Inchegiri branch of the Navnath Sampradaya. he offered initiation to this Sampradaya. Ramakant Sawant was raised in rural Phondaghat, Gadgesakhal Wadi. In 1965 he attended the prestigious establishment of Elphinstone College, at the behest of Nisargadatta Maharaj. Following this, he graduated from Bombay University in 1972, (M.A in History and Politics). In 1976, he obtained his LLB qualification, from Siddhartha Law College, Bombay. He worked in the Legal Department of the bank. This from 1970 till he retired as bank manager in 2000. He is married to Anvita Savant, also a disciple of Shri Nisargadatta Maharaj. They have two sons. In 1962, Ramakant Maharaj was introduced by relatives to his future guru, Sri Nisargadatta Maharaj. After spending a few months with the Master, he took the Naam Mantra, the Guru Mantra on 2nd October, 1962. From then on, he visited Nisargadatta Maharaj and listened to his lectures regularly, until his Master's Mahasamadhi in 1981. During the last decade or so at the Ashram in Nashik, Sri Ramakant Maharaj introduced many students/disciples/devotees from around the world to these teachings and initiated them into the Inchegiri Navnath Sampradaya Lineage. Interviewer: I would like to introduce Ramakant Maharaj, a direct disciple of Nisargadatta Maharaj. I am very pleased to meet you. Maharaj, can you tell me a little bit about your background, childhood or the early years in your life? Ramakant Maharaj: Early years was in my native place, education completed in my native place. Then I came to Mumbai/Bombay. Some small services I was doing. Then I went to live with some relatives. The relatives approached Nisargadatta, and I met Nisargadatta Maharaj. After some months I took the Naam mantra with Nisargadatta in 1962. Nisargadatta Maharaj gave me the naam mantra, guru mantra. Since then I am visiting Nisargadatta Maharaj and listening to his lectures. Meditation most important, meditation every day, according to Nisargadatta Maharaj. I: So, you were with Nisargadatta Maharaj for nearly 20 years? I: What was it like as a disciple with Nisargadatta Maharaj himself? How did it feel for you? Maharaj: His speeches and lectures were very touching, very exceptional. At that time, I was not mature enough to understand what he was saying. But gradually he used to say ‘listen to me, listen to me’. Every day he was having lectures so at 6.30 to 7.30 and in the evening too. Listening to it and bhajans. I: You’re now teaching here in the ashram in Nashik, are your teachings the same as your Master’s Nisargadatta Maharaj, or slightly different? Maharaj: Teaching the same but the words are different. Principle the same: Except your Self there is no God no Brahman, no Atman, no Paramatman. These are the principles of spirituality. So the same thing in different words I am placing before the devotees - the Ultimate Truth. I: So you basically summarised the teachings there very briefly. You are part of a very strong lineage here. Can you speak about the lineage and the Masters? Maharaj: Basically the head of the lineage is Dattatreya, the Navanath Sampradaya. So the disciple of Dattratreya was Revannath Maharaj (p.65 bhajans)- the head of our lineage. Since then his disciple Kadsiddheswhar Maharaj...1234 5 like that. And then Guru Lingajangam Maharaj came from the …..? 3mins 57secs. 300 yrs after that at Pulapur. And then from Guru Lingajangam to Bausaheb Maharaj, Kad…...Sidd….. I: Can I ask what do you see as the role of the guru in the teachings? Maharaj: The guru’s importance is that he is inviting attention of the invisible silent listener, except your Self, nothing is there. … all this atman, brahman, paramatman, God is word knowledge, book knowledge. According to Nisargadatta Maharaj, except your selfless self there is no God, no brahman, no atman, no paramatman. So be calm and steady. I: Can I ask you what do you mean by self-realization? Sometimes you say it is easy to attain but other times it is difficult. Maharaj: Just to know oneself in the real sense. We’re knowing ourselves in body form. It’s not your identity. Your identity is unidentified, invisible, anonymous identity. So your spontaneous presence is the cause of the projection of the world, so you are ultimate truth, you are unborn. Devotees are people that want some happiness, peace of mind, tension-free life, fearless life. These things can happen once you know yourself in the real sense. You’re totally unborn but you’re thinking I am born and I am going to die. That concept is an illusory thought. This knowledge enlightenment will help you realize what is the ultimate truth, final truth. I:You have said to me that book knowledge is dry and of little use. Why is dry knowledge of no use? I: Following on from that there are a couple of books such as I Am That by Nisargadatta with his teachings, and Master of Self Realisation by Siddharameshwar Maharaj Teachings - is there anything that makes these books different from dry - can they be more alive living? Maharaj: Siddharameshwar Maharaj and Nisargadatta Maharaj had the same the same message except your selfless self there is no God, no Brahman, no Atman, no Paramatman. So all the saints, all the so-called masters in their different speech, gave the one message that except yourself there is no master, no God, no Brahman. So know yourself in a real sense. I: Would you say that in particular books such as “I am That”, and “Master of Self-Realization” you could recommend as being not so dry? Maharaj: You have to undergo all this knowledge. These are guidelines. What is said in 'I am That' and all these books, is inviting attention of the reader that you are Ultimate Truth, you are Final Truth. So all scriptures, all these spiritual books give one message, except your selfless self there is no God. To say “God”, your spontaneous invisible presence is required. I: If I were to try and compare your teachings and the lineage, with any other tradition, what might be the closest or is this tradition unique? Maharaj: It is having some scientific reasons so we are giving the guru mantra, naam mantra considering the sensitivity of the spirit. The spirit. Or the measure/nature of the spirit is that what you are saying is impressed on it – so it comes out in the same way. The naam mantra, the meaning of the mantra is “I Am Brahman, Brahman I Am”, like that. Considering the sensitivity of the spirit this mantra is given. After reciting that mantra the realization process will be spontaneously inside. Your inner master will be, will come with all this knowledge, spontaneous knowledge – already we all have it – but you are not knowing – you are unaware of knowledge, you are unaware of your identity, so therefore this process of reciting of mantra is used. Maharaj: Same teachings. The same, Shankaracharya says: To say “I” is illusion, to say “you” is illusion, to say “Brahman” is illusion. Entire world is illusion. The same message is given by all the spiritual masters. I: Thank you for your time. I am sure many people will be interested to know that you are teaching here in Nasik. Maharaj: Self-enquiry, Self-knowledge, Self-realization. These are the set stages. Everybody's reading so many books, they are talking about Brahman, Atman, Paramatman, God. It is very easy to talk. But one should question oneself. Out of all this knowledge, What am I? What have I got? Question whether I am completely free from this fear – the fear of death? Whether I have complete peace, whether I have complete happiness without any material cause? One should question oneself. If the answer is 'No', then it is only literal knowledge that one has - both literal and little. Be practical, everything is in you, but we are searching here and there. But we are ignoring the searcher, we are ignoring the finder. You have tremendous power but you are unaware of that power. You are underestimating yourself, saying I am man or woman. That is not your identity, this identity is to be dissolved some day or other. Body is having some time limit but you are everywhere, you are omnipresent, just like the sky. If at all you want to compare yourself let it be like the sky. We are bound by the body knowledge, food-body knowledge, therefore we are trying to find out where there is happiness, where we can find complete peace. Complete peace and happiness are only words. Just think, how I was prior to beingness? At that time there was not any God, Brahman, Atman, these are the words. After dissolving the body, what is my status? - You say “I don't know”. So all these requirements for these things, God, Brahman, Atman are body related. To have these, there is a material cause. That is illusion, so we have to come out of the illusion. What is the Reality? Reality is impressed by the Masters. Reality of the listener – the invisible, anonymous listener. What is the result of that? After knowing yourself in a real sense, you will be completely out of fear. Because I am unborn, (it follows), so why should I have fear of death and birth? There is no birth and death. No birth, no death. Questions of heaven and hell never arise. Rebirth and all these concepts are there, prarabdha, karma, so many things are there, (all concepts). So just to know your Self in real sense, (in order to), spirituality is most important. OK.